There is a connection between those of us who spend time with horses, whether it be for sport or pleasure. We have been inspired by their majesty, strength and powerful presence. Owning a horse, paying his board, feeding him and grooming him, does not determine a strong bond with him though. A bond is created away from work, pressure and demands, as horses thrive in quiet spaces where they feel no need to flee a situation. The bond begins here, and then strengthens when we ask them to move through moments of pressure; to come through the other side safely and comfortably with us as their guide. Mutual trust and respect are formed by this strong bond. Something happens for me when I develop a connection with a horse. This feeling is very raw and refreshing. The bond that develops through connection is of great value to horses, as they can feel safe and respected in the presence of someone who cares enough to take the time to connect with them. The following six exercises are small moments that I practice daily with horses. They create a deepened connection that causes the horse to offer me more of their effort, and to stay longer mentally and physically when I request more challenging tasks of them. 1. The way you greet your horse every time will deepen your connection or weaken it – whether from the stall, pasture or paddock. Approach him passively. Allow him to meet you rather than walking right up to his face. Let him smell your hand, and wait for him to take interest in you if he does not show immediate enthusiasm towards your plan. This simple approach takes pressure off the horse, and allows him to feel involved from the beginning of each session. When you put his halter on and come from the field, your first moments together should be in unison. Try to match his relaxed energy as you walk together, and then as you progress through your session you can ask for a little more animation and speed if needed. Experiment with starting off on his page – avoid rushing up to the barn dragging him behind you. Breathe together and walk together, keeping in mind that he was most likely relaxed before you arrived. This thoughtful approach to greeting your horse can set the mood for a great session. 2. Go for a walk. Most horses enjoy a change of scenery. Take him for walk similar to the way you would walk with a (well mannered) dog – through the barnyard, down a trail, around a hay field, or even just up the driveway. Horses that get nervous about going further away from the barn can be walked short distances, slowly increasing the length of your walk over several sessions as they begin to relax in the new spaces. Allowing him to set the pace for a leisurely meander at the beginning or end of a work session, or in place of a working session is a great way to develop a connection. 3. Use your hands to create a bond and connection. 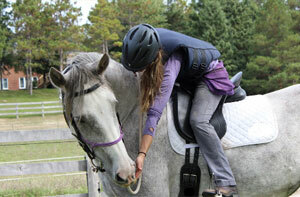 Find your horse’s itchy spots and give him a good scratch until his lips quiver as he thoroughly enjoys your attention. Become aware of his tight muscles or stiff limbs and gently massage and rub on him rather than just brushing the dirt off before riding. I call this “handy brushing” and I can usually remove all the dirt and loose hair with just my hands. Incorporate some simple body work to help loosen him up and prepare him for his work. My mare will stand for what seems like forever while I practice T-Touch on her. Your careful intentions come through your hands into your horse. 4. Leave allowance for your horse to give feedback. He may be trying to tell you to slow down by acting antsy when you go through your usual routine. He could also get antsy if you spend too much time obsessing over details that he finds unnecessary or annoying. For example, my mare cooperates with having her forelock brushed and her eyes cleaned of any debris, but she does not prefer having her face rubbed, patted or brushed. When I finally recognized that she didn’t enjoy having her face touched, I respected her personal space and kept this time to minimum. Grooming became more relaxing and she became much more patient when I realized that she preferred a neck scratch over rubbing between her eyes. Other horses love having their faces touched, but our connection has become stronger since I have learned to listen to her feedback. 5. When you get on your horse, take a minute to just sit and relax, breathing consciously before asking your horse to move off. When you finish your ride, take a moment after dismounting to stand and relax with your horse. Stroke him or find an itchy spot to scrub, rather than just getting off and heading to the barn. Energy and intention are everything! Horses are intuitive, so they sense our emotional state, read our body language, and feel our intentions. They are very sensitive – a quickened heart rate or clenched jaw can tell them enough to know something is wrong. Our smooth movement and soft, confident posture are clear signs that we are comfortable, and worth hanging around with. Give your horse time to respond to your requests. Use your legs, seat and rein aids gracefully, allowing him time to think, understand and respond. 6. Mimicking your horse’s movements will gain his interest and curiosity about you. Set your horse loose in a space such as an arena or paddock, and begin to mimic their movements. Walk as they walk, turn when they turn, pause and crouch when they roll, run playfully if they take off in a trot or gallop – just let loose and play with the idea of mirroring your horse. This is a great exercise to start creating some fun, with your horse at liberty to decide when he wants to move closer to you and interact. Then eventually you can start to make small changes and see if he will notice and begin to mimic your movement. 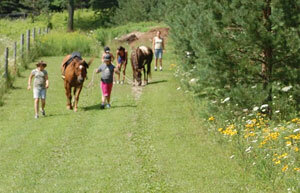 Horses are herd animals and naturally move in unison with those they trust and respect. Create an atmosphere where your horse feels keen to watch you, and begins to follow your suggestions. This is a low pressure situation, as it is not meant to be demanding. Mimicking is a different kind of exercise from free lunging or round penning. Why do I care about having a connection and bond with the horses I interact with? Anyone who feels respected and considered is going to bring more to the relationship. This is true of people, interactions with other animals, friendships, partnerships, parenting, etc. Horses are a joy to interact with when they are in a good mental space. I want my horses to feel good about being around me. It doesn’t matter how long you have owned your horse or what your history is with them. It can take time for them to begin to see you differently, but they will notice when you make changes to your approach while seeking a better connection.